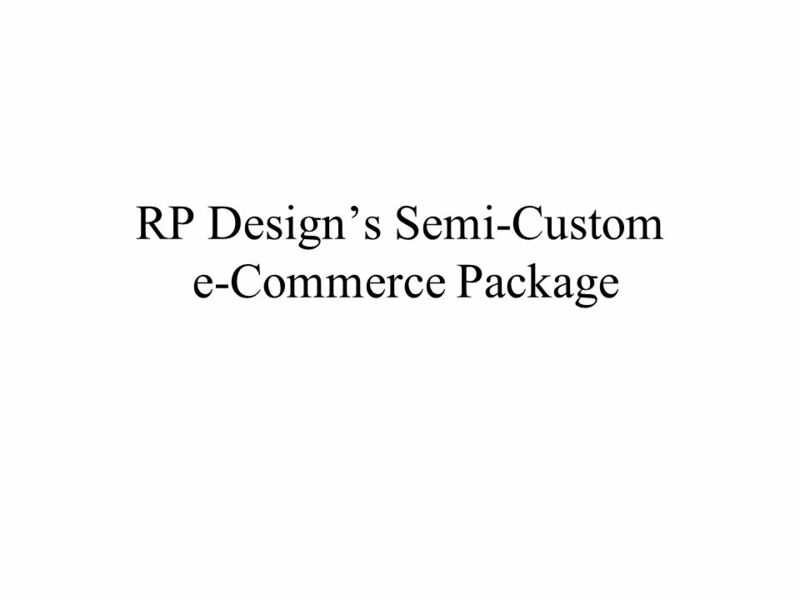 RP Designs Semi-Custom e-Commerce Package. Overview RP Designs semi- custom e-commerce package is a complete website solution. Visitors can browse a catalog. 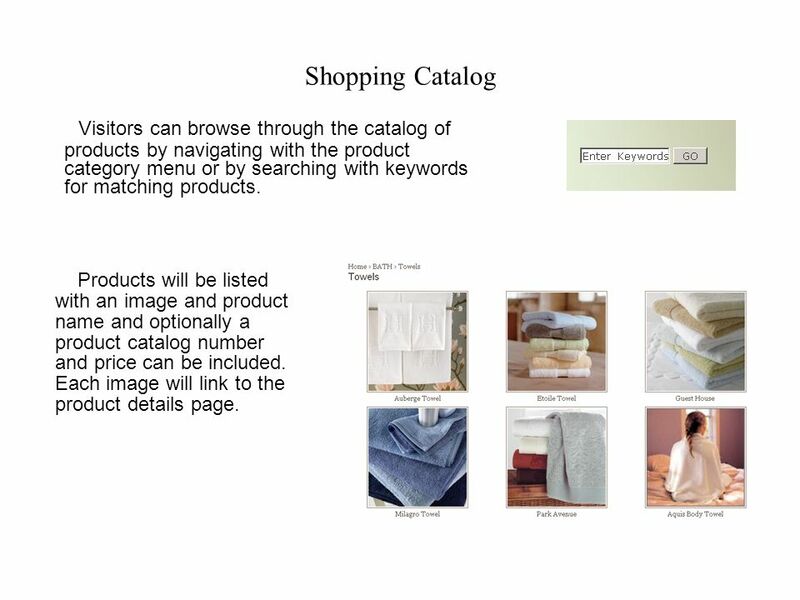 3 Shopping Catalog Visitors can browse through the catalog of products by navigating with the product category menu or by searching with keywords for matching products. Products will be listed with an image and product name and optionally a product catalog number and price can be included. Each image will link to the product details page. 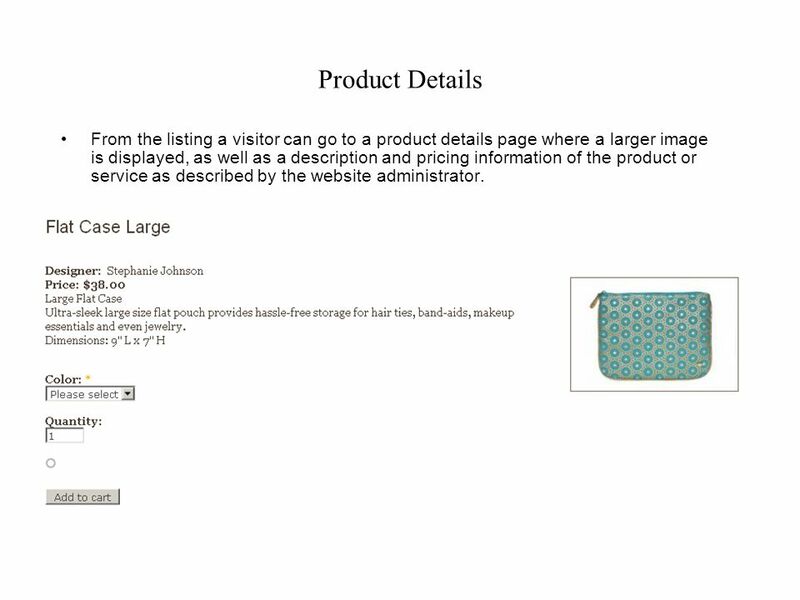 4 Product Details From the listing a visitor can go to a product details page where a larger image is displayed, as well as a description and pricing information of the product or service as described by the website administrator. 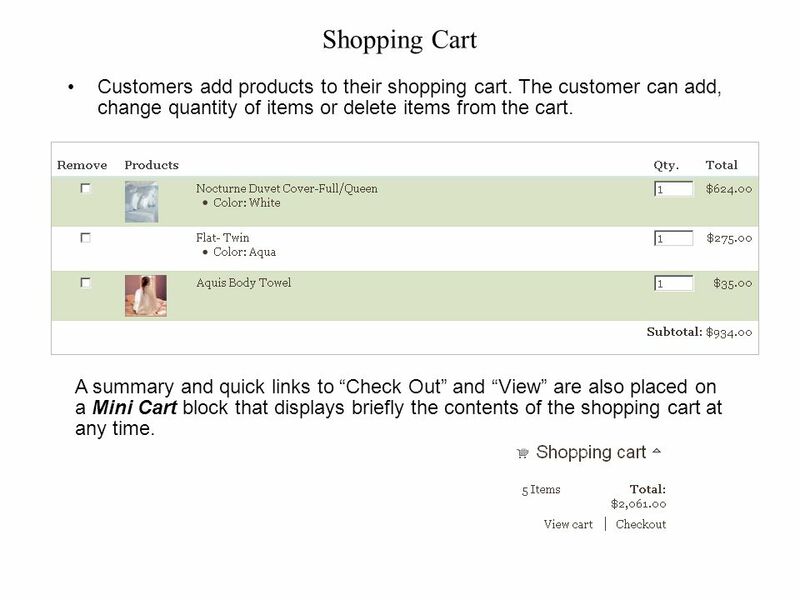 5 Shopping Cart Customers add products to their shopping cart. 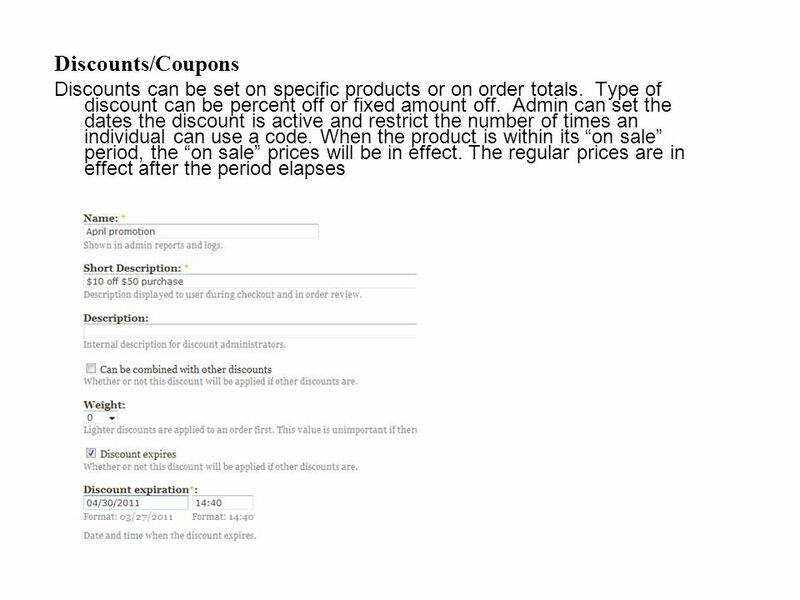 The customer can add, change quantity of items or delete items from the cart. A summary and quick links to Check Out and View are also placed on a Mini Cart block that displays briefly the contents of the shopping cart at any time. 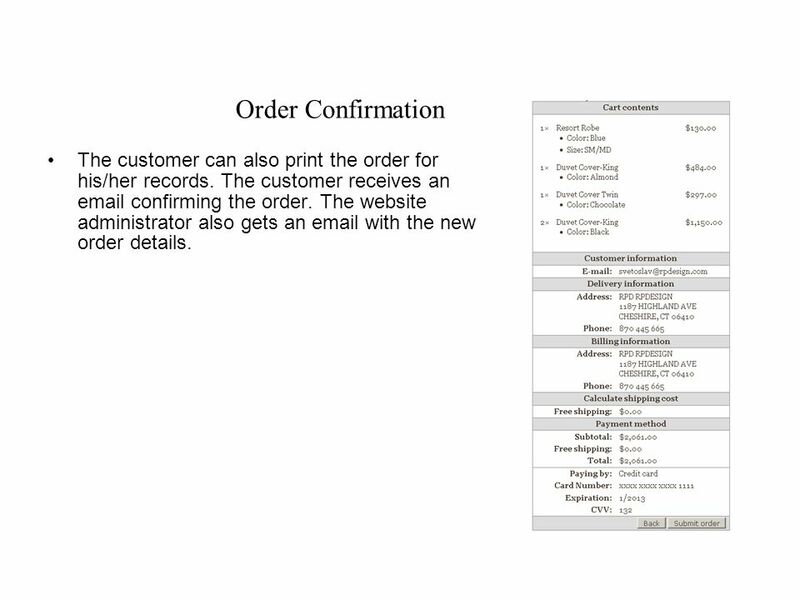 7 Order Confirmation The customer can also print the order for his/her records. The customer receives an email confirming the order. The website administrator also gets an email with the new order details. 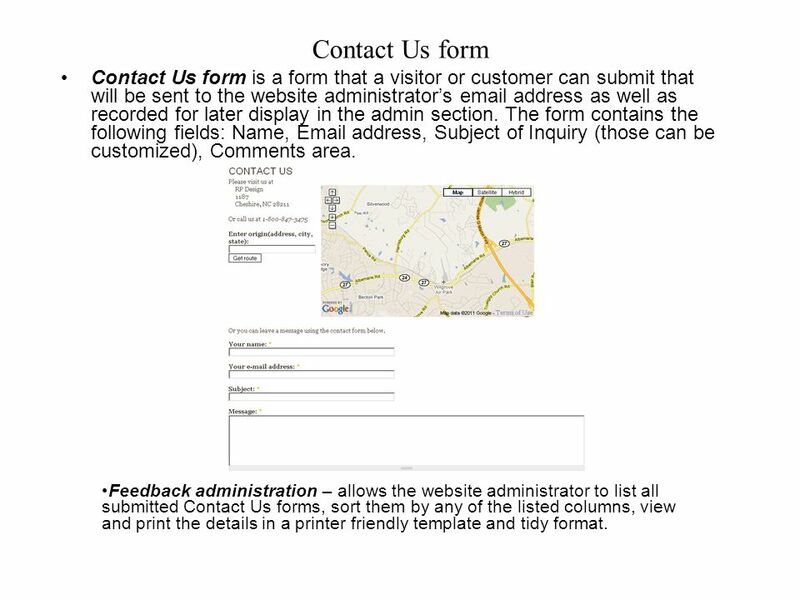 8 Contact Us form Contact Us form is a form that a visitor or customer can submit that will be sent to the website administrators email address as well as recorded for later display in the admin section. The form contains the following fields: Name, Email address, Subject of Inquiry (those can be customized), Comments area. Feedback administration – allows the website administrator to list all submitted Contact Us forms, sort them by any of the listed columns, view and print the details in a printer friendly template and tidy format. 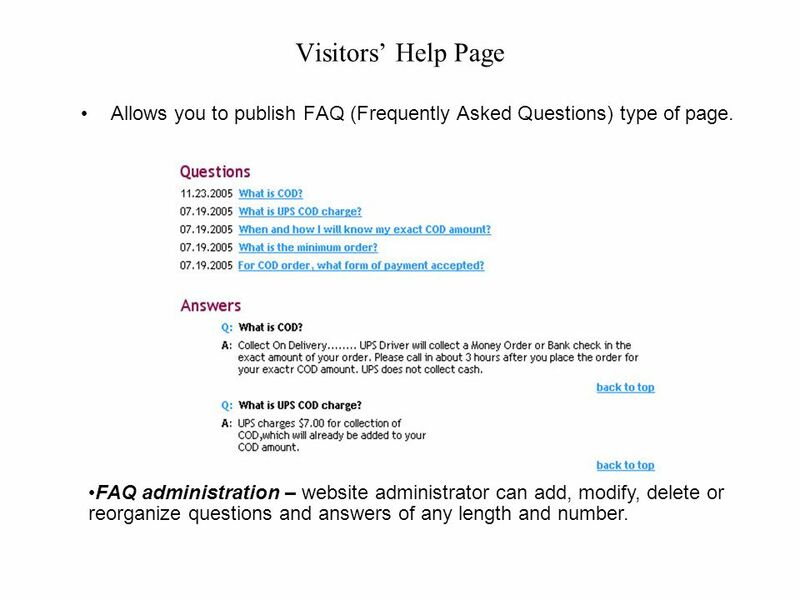 9 Visitors Help Page Allows you to publish FAQ (Frequently Asked Questions) type of page. FAQ administration – website administrator can add, modify, delete or reorganize questions and answers of any length and number. 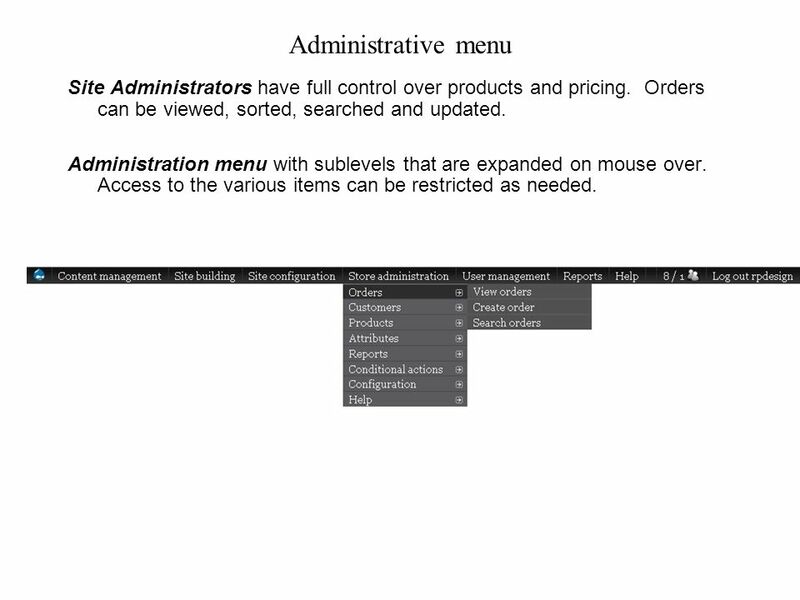 10 Administrative menu Site Administrators have full control over products and pricing. Orders can be viewed, sorted, searched and updated. Administration menu with sublevels that are expanded on mouse over. Access to the various items can be restricted as needed. 11 Product Categories Multi-level product category menu – This menu is used for visitors to navigate to categories or subcategories of products as well as for website managers to administer categories and products. This menu is customizable in terms of: fonts, colors and mouse over effects. This menu can be modified by site administrators. 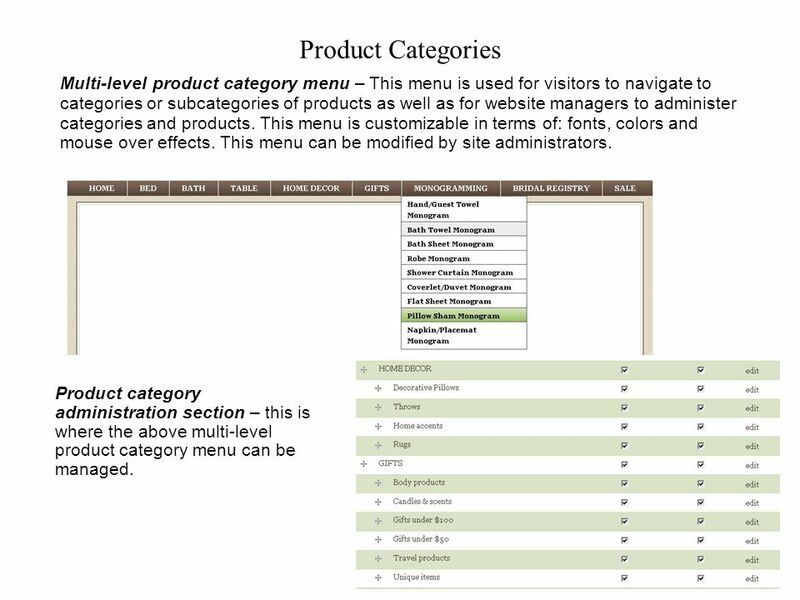 Product category administration section – this is where the above multi-level product category menu can be managed. 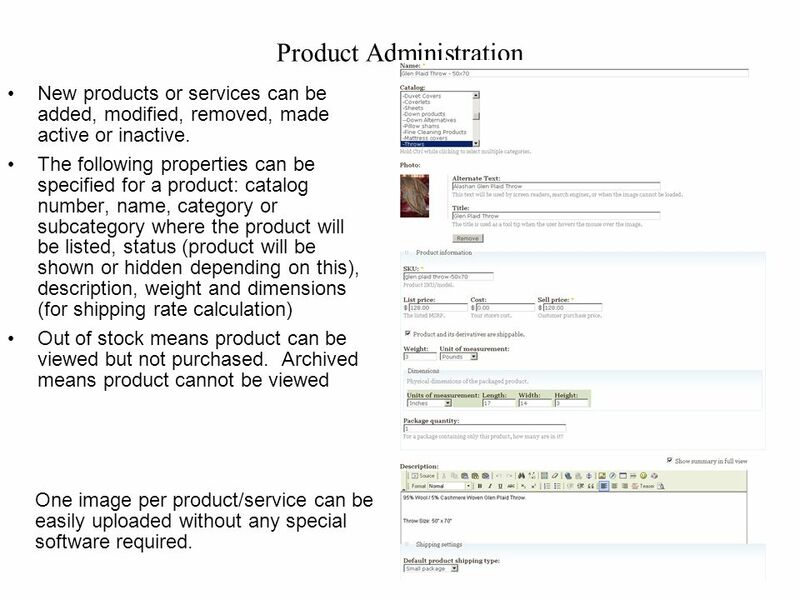 12 Product Administration New products or services can be added, modified, removed, made active or inactive. 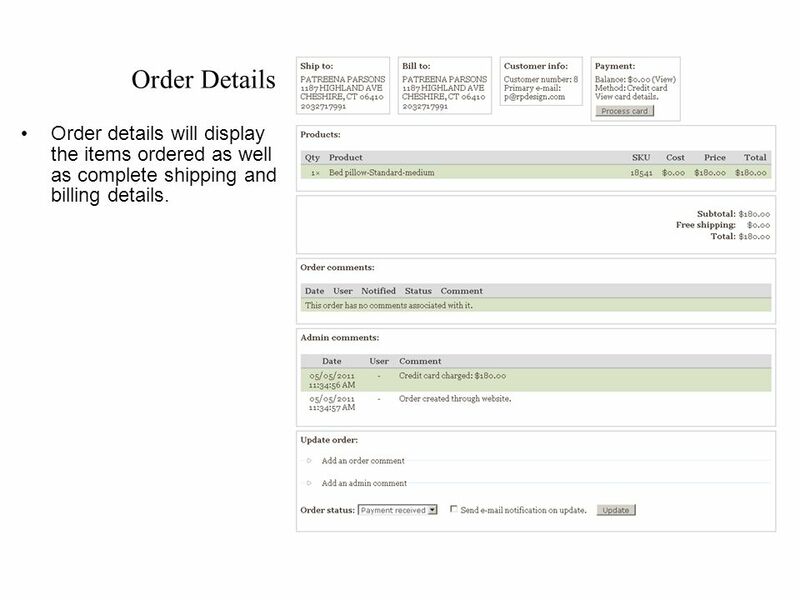 The following properties can be specified for a product: catalog number, name, category or subcategory where the product will be listed, status (product will be shown or hidden depending on this), description, weight and dimensions (for shipping rate calculation) Out of stock means product can be viewed but not purchased. Archived means product cannot be viewed One image per product/service can be easily uploaded without any special software required. 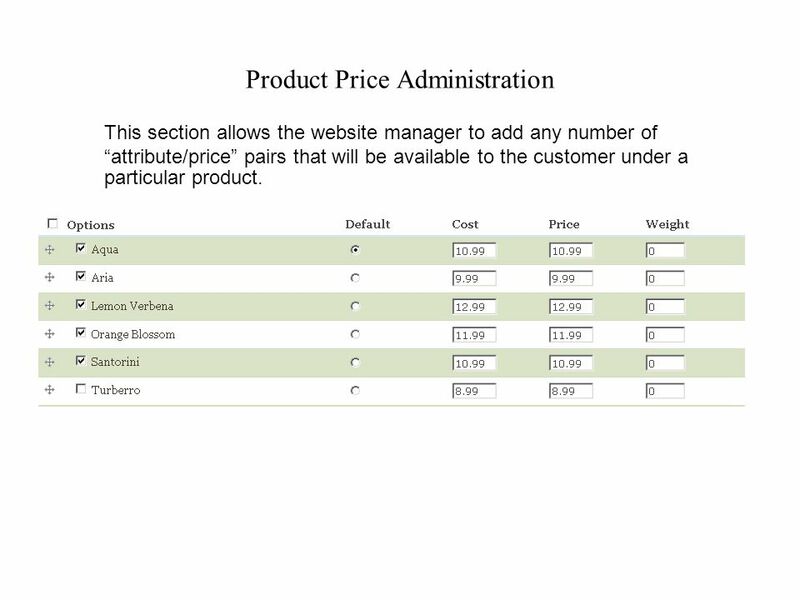 13 Product Price Administration This section allows the website manager to add any number of attribute/price pairs that will be available to the customer under a particular product. 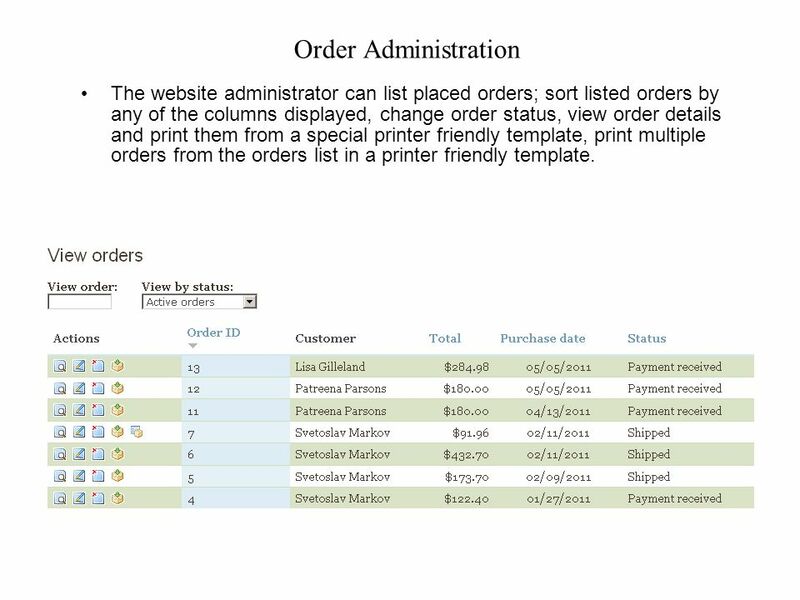 14 Order Administration The website administrator can list placed orders; sort listed orders by any of the columns displayed, change order status, view order details and print them from a special printer friendly template, print multiple orders from the orders list in a printer friendly template. 15 Order Details Order details will display the items ordered as well as complete shipping and billing details. 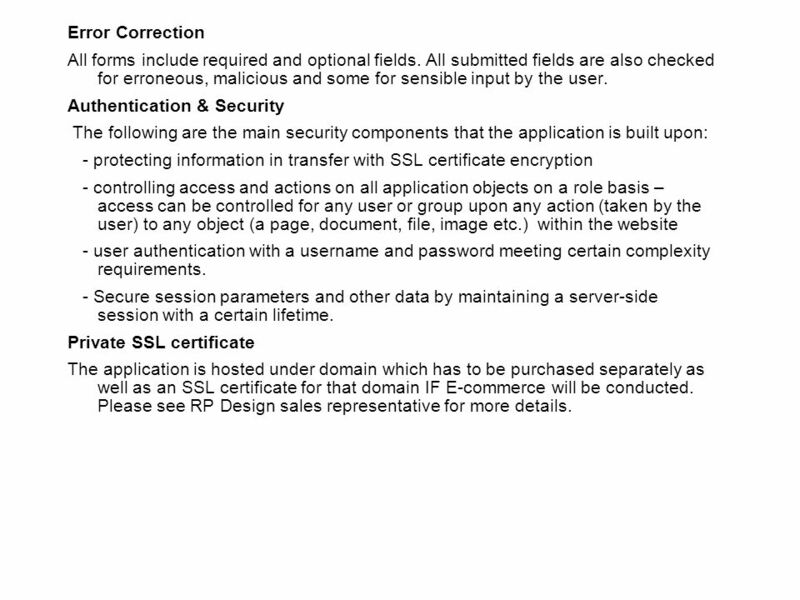 17 Error Correction All forms include required and optional fields. All submitted fields are also checked for erroneous, malicious and some for sensible input by the user. Authentication & Security The following are the main security components that the application is built upon: - protecting information in transfer with SSL certificate encryption - controlling access and actions on all application objects on a role basis – access can be controlled for any user or group upon any action (taken by the user) to any object (a page, document, file, image etc.) within the website - user authentication with a username and password meeting certain complexity requirements. - Secure session parameters and other data by maintaining a server-side session with a certain lifetime. Private SSL certificate The application is hosted under domain which has to be purchased separately as well as an SSL certificate for that domain IF E-commerce will be conducted. Please see RP Design sales representative for more details. Download ppt "RP Designs Semi-Custom e-Commerce Package. Overview RP Designs semi- custom e-commerce package is a complete website solution. 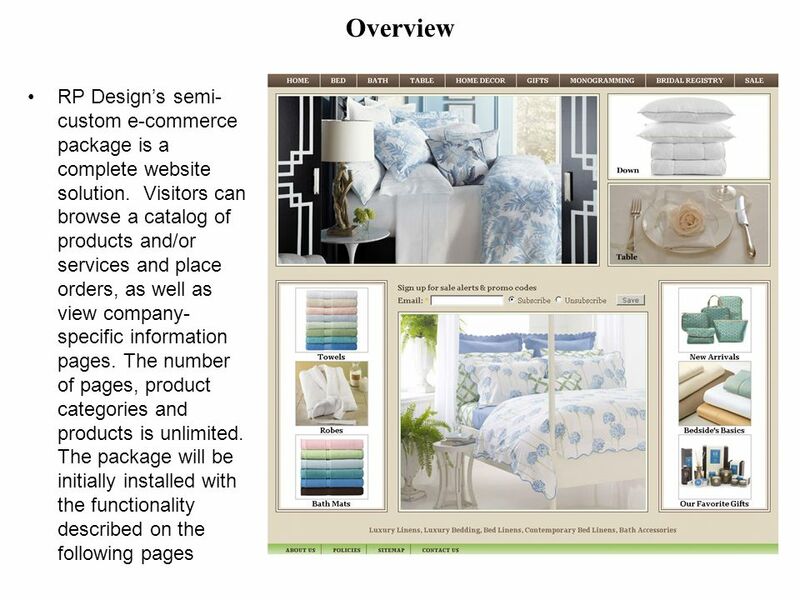 Visitors can browse a catalog." 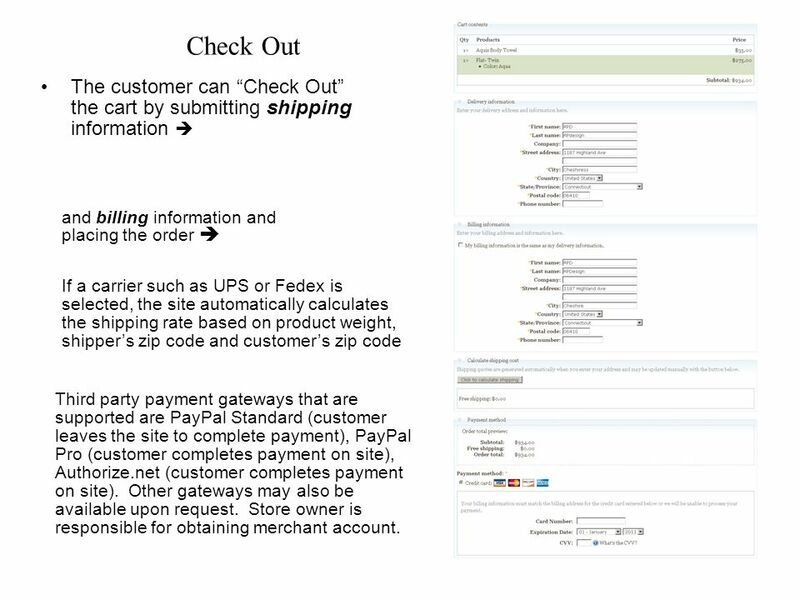 Order Inquiry and Change Order eCommerce Enhancements An Overview to eCommerce Enhancements March 2012. A Product of Online E-Commerce (B2C) Store front Solutions Sell Direct to clients and maximize your Profits Copyright © ANGLER. HP Support Agreement Manager Tools Support Contract Assistant (SCA) Quick Reference Guide September 2006. 09/04/2015Unit 2 (b) Back-Office processes Unit 2 Assessment Criteria (b) 10 marks. Introduction to ePro and the GeorgiaFIRST Marketplace 1© 2011 Board of Regents of the University System of Georgia. All Rights Reserved. Web Store Training. Table of Contents Sign In : Accessing the site My Profile : Managing your account Catalog Navigation : Finding items and ordering. e-DMAS Consumer Web Order Entry (WEBOE8) An Enhancement For iSeries 400 DMAS from  Copyright I/O International, 2003, 2004, 2005 Skip Intro. Federal Acquisition Service U.S. General Services Administration Air Force Advantage! Realtime Equipment Database F.R.E.D. stands for Fastline’s Realtime Equipment Database. F.R.E.D. will allow you to list all your inventory online. F.R.E.D. Training Guide. The Punch Out Catalog System The Punch Out shopping catalog for West Press takes the user directly into the vendor’s website and online. Training Guide. The Punch Out Catalog System The Punch Out shopping catalog for Office Depot takes the user directly into the vendor’s website and online.